“This Did Not Begin with Freddie Gray”: As Baltimore Awaits Answers, A Call for Long-Term Solutions | Democracy Now! president and CEO of the NAACP. He’s also a longtime human rights advocate, civil rights lawyer and minister. Update: Warrants have been issued for the six officers involved in Freddie Gray’s death. 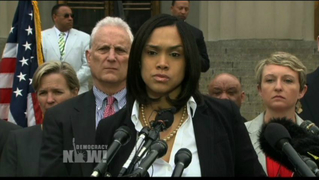 Watch the full press conference by Baltimore State’s Attorney Marilyn Mosby. Protests continue in Baltimore over the death of Freddie Gray as more evidence emerges that the 25-year-old died from injuries inside a police transport van. On Thursday, police revealed that the van made a previously undisclosed stop with Gray inside. The new stop was discovered from security camera footage, not from speaking to the officers involved. The investigation also reportedly concludes Gray’s spinal injuries had to have happened inside the van, not when he was initially detained and dragged on the ground. The medical examiner reportedly found that Gray’s spinal injury was caused by his slamming into a bolt in the back of the van. It remains unclear how. Meanwhile, a key witness in the case has rejected police claims that blamed Gray for his own injuries. Baltimore police investigators have given prosecutors the initial findings from their probe, paving the way for potential indictments. We are joined by Cornell William Brooks, president and CEO of the NAACP. JUAN GONZÁLEZ: We turn now to Baltimore, where investigators have handed over their inquiry into Freddie Gray’s death to the state’s attorney’s office. Gray died of spinal injuries a week after he was arrested for looking a police lieutenant in the eye, then running away. His family said his spine was 80 percent severed at the neck. State Attorney Marilyn Mosby will now decide whether to take the case to a grand jury to seek an indictment of any of the six officers involved. AMY GOODMAN: Meanwhile, police in Baltimore revealed Thursday that the van transporting Freddie Gray made a previously undisclosed stop while en route to the police station with him at the back. Police said they found out about the new van stop from a security camera, a private security camera. This is Baltimore Police Deputy Commissioner Kevin Davis. DEPUTY COMMISSIONER KEVIN DAVIS: We discovered this new stop based on our thorough and comprehensive and ongoing review of all CCTV cameras and privately owned cameras. And, in fact, this new stop has been—was discovered from a privately owned camera. JUAN GONZÁLEZ: The investigation also reportedly concludes that Gray’s spinal injuries had to have happened inside the van, not when he was initially detained and dragged on the ground. The medical examiner reportedly found that Gray’s spinal injury was caused by his slamming into a bolt in the back of the van. It remains unclear how. AMY GOODMAN: Thousands of police and National Guard troops continue to enforce a curfew in Baltimore following an uprising Monday night, which saw cars and buildings torched. Freddie Gray’s death has sparked nationwide protests, from Boston to Chicago to Ferguson, Missouri, with rallies spreading on Thursday. In Philadelphia, a thousand people gathered in front of City Hall to hear speeches in support of the Baltimore protesters, then tried to go onto a major highway. To talk more about the significance of what’s happening in Baltimore, we go to Washington, D.C., where we’re joined by Cornell William Brooks, the president and CEO of the NAACP. He’s a longtime human rights advocate, civil rights lawyer and minister. We welcome you back to Democracy Now! Of course, the headquarters of the NAACP is based in Baltimore. Cornell William Brooks, why was Freddie Gray arrested, to begin with? AMY GOODMAN: Just one minute—can I interrupt for just one minute? AMY GOODMAN: Even the attorney for the Fraternal Order of Police said that he looked a police lieutenant in the eye, and then he ran. And he said running in a high-crime area is an arrestable offense. CORNELL WILLIAM BROOKS: I’m not sure where in the penal code that’s an offense. Running in a high-crime area in which there is a high degree of distrust of the police is not an irrational response. And where the police department has a long and tragic legacy of troubled relations with the community, police brutality, running from the police, again, perhaps not the wisest thing to do, but not an irrational thing to do. JUAN GONZÁLEZ: Cornell William Brooks, the most recent revelation now that a private security camera discovered that the officers had made an undisclosed stop transporting him to the precinct, one, obviously, these officers are now definitely—no matter what happens, they will be off the force, because they didn’t report that stop. But, once again, security cameras have revealed information that official reports of police officials and cops did not present to the public. CORNELL WILLIAM BROOKS: Yes. I mean, this is a part of what appears to be a pattern of incomplete disclosures or leaks or suggestions that are very troubling. The fact of the matter is, we have a community on edge, looking for answers. And the thing that is best done at this point is to have an investigation that is transparent, that is orderly, where we’re not—where information isn’t getting out that puts the community more on edge. But be clear, we have a series of unanswered questions. For example, you know, how does a person—how does a suspect be put in a van without a seat belt, who is 25 years old, leaves the van with—apparently, with his spinal cord severed, and where you have a second person in the van who, contrary to earlier reports, according to his statements, he only heard some bumping in the van? He did not draw any conclusions as to what the injuries were, as was seemed to be suggested only days ago. And so, the point being is, the pattern here is very disturbing. You know, I’ve served as a government lawyer, a civil rights lawyer, a civil prosecutor. What you want to do in an investigation is stick to the facts. You want to stick to the facts. You want to do your job and make sure that people have confidence in the integrity of the process. This process thus far has not inspired confidence. And we are at a moment where credibility, legitimacy is critically important, because be clear, troops on the street can secure peace for a moment, but to secure peace ultimately, what we need is justice. And one of the best means of achieving justice is an investigation that is managed in a professional way. AMY GOODMAN: It remains unclear exactly how Freddie Gray received the spinal injuries, which would ultimately kill him, his spine severed, apparently his larynx, his voice box, crushed. Bystander video shows police dragging him to a van as he screams in pain, his body apparently limp. According to a police timeline, Gray asked for an inhaler as he was going into the van, an asthma inhaler, but a medic wasn’t called for more than 40 minutes. Earlier this week, The Washington Post obtained a police document which contains an affidavit by a fellow prisoner who was put in the van at the end of the Freddie Gray trip in that van, but he couldn’t see him because they were separated by a metal partition. The document, written by a police investigator, says the fellow prisoner told police he could hear Gray banging against the walls of the vehicle and believed Gray, quote, “was intentionally trying to injure himself.” The prisoner who was in the van with Gray is named Donte Allen. He spoke to NBC affiliate WBAL about what he heard while he was in the police van. AMY GOODMAN: When Allen was asked whether he told the police he heard Freddie Gray banging his head against the van, this was his response. DONTE ALLEN: I told homicide that. I don’t work with the police. I did not tell the police nothing. AMY GOODMAN: There you have it. That was Donte Allen. He’s the one The Washington Post piece is written about, that they say he said he intentionally tried to hurt himself. So, Cornell William Brooks, here you have this person testifying. You have the police giving a different version of what he said. You also have them driving the van, that wasn’t reported until a private security video, that information came out. The New York Times just wrote in a piece, “Investigators found … the police van carrying the 25-year-old after his arrest made a stop the authorities had not known about.” This begs the question: Weren’t the police driving the van? Aren’t they authorities? How could the authorities not know about what they were doing? What is the NAACP calling for right now? Are you calling for arrests? Are you calling for firings in the police department in Baltimore? CORNELL WILLIAM BROOKS: Well, the first thing we’re calling for is for the Maryland state prosecutor, Marilyn Mosby, to conduct a thorough, complete, comprehensive investigation and to conduct this investigation relying on the resources of her office. So, we have to focus on the first things first. We certainly look forward to the Justice Department completing the investigation, a broader investigation, that is an investigation called for by the mayor. We believe that that is critically important. We also are calling upon the city to focus on fundamental reform that really should have begun well before this case. I mean, let’s be clear: This tragedy did not begin with Freddie Gray. We have a tradition of rough riding, this practice of suspects being transported in vehicles in ways that subject them to injuries without police officers necessarily laying a hand on them. This is certainly something that the community is apprehensive about, fearful about. We have a history of lawsuits against the police department in Baltimore. The point being here is there are a number of challenges to this police department that existed before Freddie Gray. So the point being here is, while we’re awaiting this investigation and the outcome of it, and encouraging people to wait patiently, while protesting vigorously, we also have to push for systemic reform. We cannot wait for the outcome of one investigation to turn around the department, even as we’re seeking justice for this family and the community. So the NAACP is pushing for systemic reform—body cameras; civilian review boards; the modification, or, I should say, the amendment, if you will, of a bill of rights for law enforcement officers, which allows them too little responsibility. We’ve pushed for a federal End Racial Profiling Act. And—and, to be clear, the NAACP, with our Baltimore chapter, has opened a satellite office in the community of Sandtown-Winchester. Why? Because we are inviting people in to file complaints, to tell us anything that they may be aware of relating to police misconduct. The point being is to have boots on the ground, engage with the community, make sure that we’re bringing witnesses forward, which was the same strategy that we used in Ferguson. The NAACP there worked with the U.S. attorney’s office, with the Justice Department, bringing witnesses forward, and we believe that that contributed, along with our legal advocacy, to the DOJ’s report. So we have to have a high-low strategy—high-level advocacy, but on-the-ground engagement with the community. JUAN GONZÁLEZ: I’d like to ask you, in terms of those proposals for systemic change, how has the mayor, Stephanie Rawlings-Blake, handled the situation, and what is her attitude toward some of these proposals for systemic reform of yours? Because there’s been substantial criticism of the way that she has handled this crisis. CORNELL WILLIAM BROOKS: Well, the NAACP, we stand behind policies that make a difference in terms of civil rights for communities. And here are the facts. The mayor called for the Department of Justice to intervene, to look at her police department proactively, affirmatively. That’s a good thing. That’s a commendable thing. And it is the kind of mayoral leadership that can really bring about systemic, fundamental reform. The mayor, prior to Freddie Gray, I might note, prior to his tragic death, called for changes in the law with respect to the rights of police officers, in a very reasonable way. She did that prior to Freddie Gray’s death. So the point being here is, the mayor, when it’s come to these issues, has been affirmative. So, while she may be subject to criticism, the facts are the fact with respect to systemic reform. The NAACP stands with anyone, whether it be the mayor, the attorney general, the governor, who is committed to bringing about the kind of reform that could bring to an end this long, sad tradition of police brutality. When we have African-American men who are 21 times more likely to lose their lives at the hands of the police, when we have racial profiling and police brutality in the context of an era of mass incarceration, this is not only unconscionable, it’s civically and democratically intolerable. And the fact of the matter is, all across the country, there are the police departments that have gotten this right. It is possible to both decrease crime, increase community trust, and practice community policing in ways that protect the community and leave police officers safer. It has been done. It can be done. It certainly should be done in Baltimore. And I believe this mayor, based upon what she’s done, the facts thus far, is committed to that. AMY GOODMAN: The Washington Post is reporting 15 Baltimore neighborhoods have lower life expectancies than North Korea. A baby born in the largely African-American neighborhood of Seton [Hill] is expected to live only 'til 65. That's 14 years below the U.S. average and lower than 229 countries. Meanwhile, in nearby Roland Park, a largely white neighborhood, babies can expect to live to 84. That’s 20 years older, well above the U.S. average of 79. Eight of the neighborhoods have lower life expectancies than Syria. Can you, as we wrap up, talk about this and what we can expect now, with the report a day—they are emphasizing, the police, saying a day in early to the state’s attorney—what you expect the timeline to be? CORNELL WILLIAM BROOKS: Sure. The thing I would say here, Amy, is these statistics are glaring, startling, but not surprising to anyone who’s been to these neighborhoods. The Sandtown-Winchester community is not only the community in which Freddie Gray died, it’s also the community in which—gave birth, if you will, to Billie Holiday and to a hero of the NAACP, Thurgood Marshall. And yet, in that same neighborhood, in the high school that Freddie Gray went to, it is described as an apartheid high school, given the degree of racial segregation. It is a school where only a few years ago half of the teachers missed 10 or more days of school. So the point being here is, we have a community that is profoundly underresourced, so it is not surprising that the residents, the citizenry, have shorter life expectancies. But here’s the main point. The main point is, this need not be. If we have communities in Baltimore where people live to be 80, and we have communities where people live a great fraction of that, we can bring about a fundamental change—and that is the profoundly American thing to do—with investments, with boots on the ground, with smart policies, policies that have worked in other cities and that can work in Baltimore, if we collaborate, if we work together, if we’re serious about bringing about fundamental reform. It has been done, and it can yet be done in that community and in that city. CORNELL WILLIAM BROOKS: Thank you. AMY GOODMAN: —of the NAACP, longtime human rights activist and human rights lawyer and minister. This is Democracy Now! Of course, we’ll continue to cover what’s happening in Baltimore, not to mention around the country. In a moment, we’ll be back with Ralph Nader. Stay with us.